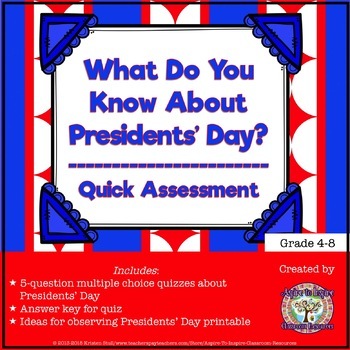 Check for prior knowledge and get the conversation going about Presidents' Day with this short, multiple-choice quiz! This festive yet fact-filled assessment is a great anticipation activity and discussion starter, which can also be used to complement a reading assignment or lesson about the holiday. ADD A CREATIVE ASSESSMENT ABOUT THE ROLES & RESPONSIBILITIES OF THE PRESIDENT TO YOUR PRESIDENTS' DAY LESSONS! In Help Wanted: President of the United States, students compose a Help Wanted ad and/or write a cover letter for the job of President of the United States. MORE FREE PATRIOTIC HOLIDAY QUIZZES! You can find this quiz, along with one for Veterans' Day and Memorial Day, in the original patriotic holiday quiz bundlein my store. You might also like the autumn patriotic holiday quiz bundle as well the summer patriotic holidays bundle.